Here Today AND Tomorrow: Part VIII - Social Entrepreneurs, Inc.
At this point in the process, you have developed (or at least thought about) all of the components for your sustainability plan. The next step to ensure that information becomes a viable, valuable, and most importantly is used to guide your organization is to write it down. Documenting and communicating the sustainability plan and commitments for moving forward increases the likelihood of achieving results. 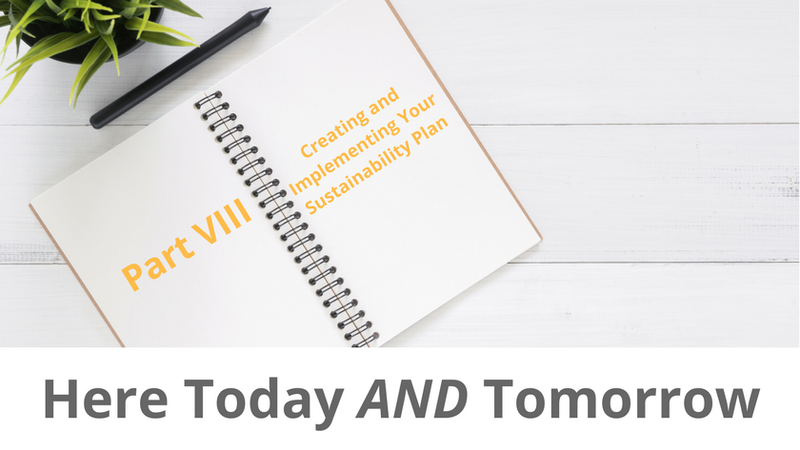 This week we close our series by reviewing the components (sections) of your sustainability plan and then touching on the subject of implementation planning. Let’s start with a look at how the eight essential elements translate into the contents of a sustainability plan that can guide your organization for years to come. Your plan will be as complex or basic as your organization’s stage of development. The number of years you have been in operation, the number of programs, services, or initiatives you implement, and your geographic reach and operations structure will dictate the depth of your plan. 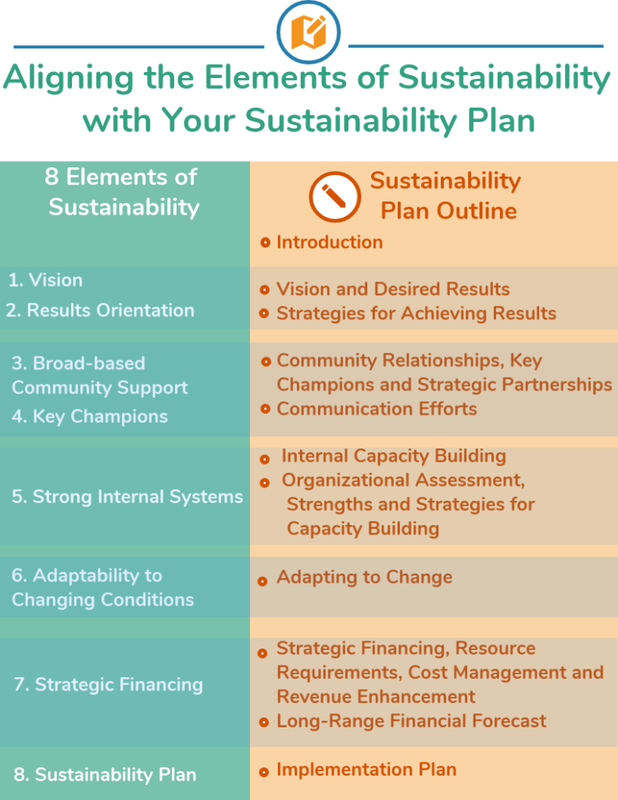 Regardless of your stage of development, all organizations need to address all areas of the plan in order to experience the benefits of sustainability planning. A plan allows you to remain focused and accountable, communicate priorities and rationale, and provide the means to measure and record progress. The mechanics of creating the plan are straightforward and begin by drafting your plan outline. SEI uses the basic outline presented in the chart above and then adapt it to meet the needs of the organization. Remember that while this is generally an internal document, it will be used to orient new staff and board members and to guide work going forward. Therefore, you want to write it so someone who has not been part of developing the components can understand the document and see where they fit into the bigger picture. We suggest building out each section of your plan as you go. That gives your organization the opportunity to review and confirm contents as they are developed, which reduces revisions and rework on the back end. The only component of the overall plan left to develop at this point is the implementation or action plan. This is where the sustainability plan comes to life. An implementation plan ensures that the work remains visible and viable and keeps the overall sustainability plan moving forward. It helps focus efforts and makes the work to execute the sustainability plan manageable. Perhaps most importantly, it makes the plan viable rather than becoming yet another document that is prepared but never really used. Before you can write your implementation plan, you need to prioritize elements in your sustainability plan on which to focus your efforts. High priority areas are those that require action within the next 12 to 15 months. The list of action areas that will result from this will need to be further refined into a manageable size. We recommend two to three action areas. In our capacity building work, SEI most often finds that high priority action areas often include building community support, strengthening internal systems, and adapting to changes. After you’ve established the priorities, the discussion becomes tactical: Who needs to do what, and by when, in order to start executing the strategies identified as first-year priorities? When organizations take the time and effort to develop an implementation plan and communicate it to their staff and board, it becomes a powerful management tool that tracks activities and keeps the organization focused on its priorities. As we conclude this series, we leave you with a few thoughts to keep in mind as you move toward sustainability. Sustainability is about more than funding to indefinitely perpetuating current programs and services at current funding and staffing levels. It’s about planning for and focusing on sustaining the continuation of community health or quality of life benefits over time. It requires clarity about what you are working to achieve and why, how you will measure your progress and results, the community champions and partners who will join you, and a strategic financing mindset and approach. This approach can increase your organization’s or initiative’s ability to create lasting improvements in health and well-being for an extended period of time despite ongoing changes in funding sources, program models, service providers, community demographics and other factors. If you’ve enjoyed this series, and want to hop on a free “Lunch and Learn” with us on April 19, 2018 from 12 pm (PST) to 1 pm, click here to sign up and tell us which element you are most interested in knowing more about.